The “Nationwide Hundreds of Millions of Students Sunshine Physical Education Winter Long-Distance Running Program” will officially start on October 26th. Within the half year from October 26 until April 30, students throughout the entire country must commit to daily long-distance running. Primary school students in the fifth to sixth grades will run 1000 meters every day, junior high school students 1500m, and high school and above must run 2000m. Daily long-distance running distances guidelines: primary school students 1000m, junior high students 1500m, high school students and university students 2000m. During holidays and the winter vacation, schools will require that students conscientiously continue long distance running and furthermore maintain a written record. Every school unit and grade must maintain a daily long-distance running program status record. When the winter long-distance running program ends, statistics from each student’s winter long distance running performance will be totaled. 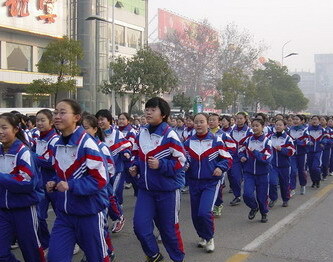 The winter long-distance running program uses 60m as a base guideline, symbolizing the 60 year anniversary of the establishment of a new China. Primary school students need to accumulate 120km, junior high students 180km, high-school and university students 240km. 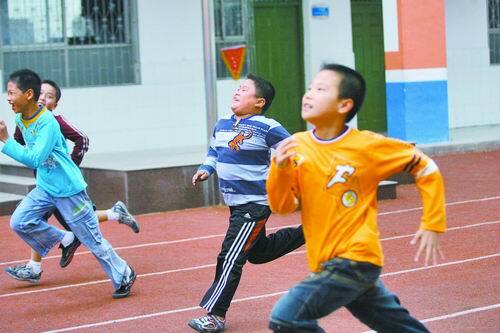 According to requirements, schools who organizing their long distance running programs must pay attention to students’ safety, especially with regards to not organizing long-distance runs on motor-routes to avoid traffic safety accidents. As a 40-plus-year-old doctor, I believe this is very good, but there are no additional facilities, no way to wash, bodies get sweaty, and could get sick. The four seasons are different, and there are also differences in handling what is done before and after running. Did the student have breakfast is also a problem. According to the country’s conditions today, I myself believe that setting physical education classes in the afternoon right before school is over is more suitable, first running together, than see what activities each person is interested in, finally return home and eat. Time should be considered in relation to sunlight, and just as cities have night cars, this should be reasonable. I have something to say. I’m not saying Japan is good, however Japanese middle and primary school students appear to have this kind of physical training, and in fact they are marathons. Once there was a saying, said that China’s only children’s stamina and will are often inferior to Japanese children of the same age, often fragile. So, at some level, for the next generation’s International competitiveness, for the country’s long-term security, this measure is necessary. The body is the revolution’s capital. Physical health is political capital. I heartily endorse this. What was the starting point of formulating this directive? (Was it for National Day’s 60th anniversary? Was it for strong physiques? Or was it to establish the dream to become a major sporting country? Isn’t this extremely formal?!) What about feasibility? (All teachers and students running together or separate? Run where? How is safety ensured? How is study ensured?) Will they have to run every day? (Could it change into running once or a few times a week?) Does anyone know how much time after running must be spent adjusting the body and mind? Its a good starting point, but this distance simply too much! 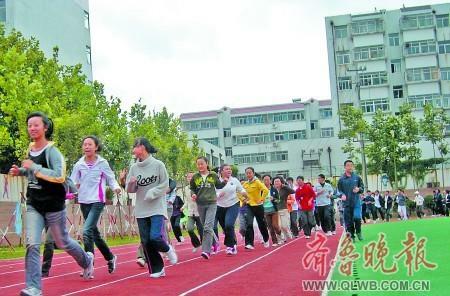 1000m for junior high students and 1500m for high school students is suitable. Asking a junior high student to run 1500m every day, isn’t that causing people to suffer? Truly absurd! How can women run during their period? How can heart disease children run? 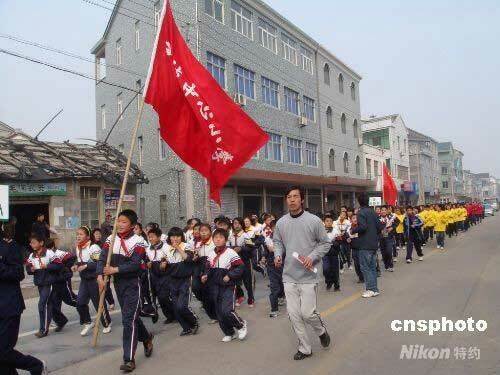 What do we do if those who cannot run are isolated by teacher and classmates? Every student in the country, sing Beijing Opera! Every student in the country, dance the friendship dance! Every student in the country, run 1000m daily…can it be done? Is there someone who always thinks unrealistically?! Only know how to cause students to suffer, may the government officials please start running to set an example! but failing will be very entertaining!!! Parental suggestion: junior high students are unable to handle their assignments, how will they have the strength and time to run that much? 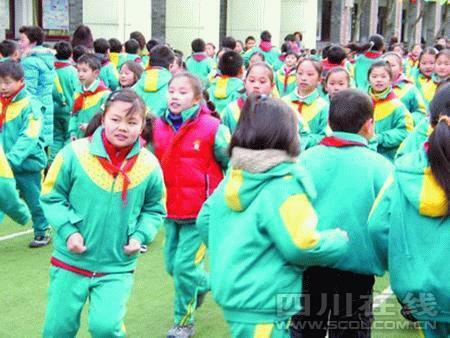 Beijing children’s college entrance exam cut-off is very low, they have the enough energy and time to run. But the competition between the population of our large province is intense, they only get to sleep about six hours every day. Throughout the two years in junior high, my child did not grow taller, and became so skinny my heart hurts, and could not stand up! The original idea is good, but it needs to be appropriate. Running 500m is enough. Impractical! Having these children run 1500m every day, do books no longer need to be studied? And can they handle it? Will they be able to lift them? Playing to the gallery! 60th anniversary, every junior high student has to run 1500m everyday, after 20 days they’d finish running. Fortunately, the time since the country was founded is not long; if it was the 200th national anniversary… Since the founding of the country, the teaching materials the Education Department has provided have always been prototype/experimental editions, never official editions, does this organization/body still have a reason to exist? Won’t go! Won’t go! Won’t go! I want to swim! First, let us not say that the boys definitely cannot endure this, can girls run 1500m every day?? Isn’t the long-distance running test only 800m?? One day running 800m twice?? It will kill people. Moreover, girls enganging in appropriate exercise does have benefits for maintaining their figure, but everyday running like this, will result in muslces, and that will no longer be beautiful. The opposition’s majority are the students who are being forced to run, the majority of the supporters are parents and those who ran before, hehe. Run! Even better, twice a day, no discussion. Primary school students 1000m? You’re tiring them to death, simply unrealistic. After high-school students run 2000m, non-dormitory schools basically all don’t have washing facilities. After the children finish running, they have no way to wash, are we supposed to let them continue class stinking with sweat? Simply impossible. Increasing physical education class or physical exercise class is of course okay. But every day having children run like this, without other facilities matching, is basically an inflexible way of doing things. Under the circumstances of facilities matching, increasing physical exercise class is okay. But today’s circumstances does not allow something like this. Allowing a high school grade’s classrooms to be smell bad every day, is this a good way to have class? Be content they did not say 1500m hurdles. The Education Department once again talking nonsense, its regulations are simply useless. I propose the Ministry of Education officials run first, and not spend all day playing tennis and golf. Second, if there are no conditions for running, they could change to other [exercise] methods. Some sports field become dust fields when students attend their physical education classes, how can the whole school run? The Education Department once again is having mental disorders. This is purely either water entering their brains or too much time working behind closed doors. I originally did not want to yell at the Education Department, but after seeing that they have once again made this type of directive, its once again unbearable…how could something it is obviously unfeasible be so quickly promulgated? I also don’t know how long the education management body of a country this large can be seized by those water-flooded pigs!!! My impression of those Education Department officials who make these sort of decisions is a group of fat headed, large eared pigs who sit in the office! The whole countries economic development situation is not equal, schools conditions and environments face a large disparity. This group of pigs waste all day not doing their own jobs, but rather smack their head and come out with these “sweeping” follies!!! Just do the few physical education classes properly every week and it will be good enough, the majority of the country’s primary-middle school physical education classes only go through the motions. The teachers have more time, but the students only play. Just properly having the existing physical education classes will be stronger than anything!!! It should be this way. Little Japan requires children just a few years old to start running long-distance every day, their physiques are good, a shirt and thin sweater is enough in winter, and walking a few kilometers does not result in especially heavy breathing. We should also ensure the health of our children’s bodies while they are young, rather than just scores. Otherwise, if another war comes, it would really be difficult to say [what would happen]. it could be truly difficult. As for space [to run], as long as there is determination, anything is possible. Not sure if the university entrance exam testing system is completely nonsense, I am an elementary school music teacher, the entire school has 40 classes, there are no more than 40 people who participate in music interest activities, everyone else in the school is in the Math Olympiad! When I was in middle school, every morning during winter the school would organize the students to run, I think more than 3000m. At first it was a little tiring, but later the feeling was great!!! Motherfuckers, even this drags in politics. Not a bad idea, but if it is just to curry favor with the government then that should be avoided! Sometimes I think having American is really good. If communist thinking spread to the whole world, who knows what would become of the whole world. Some people are being hypocrites. How can people with bad physiques endure running 2000m every day? Once a week may be acceptable, everyday is obviously too much. Many poor students live on porridge every day, studying already consumes a lot. If this is added everyday and their meals do not match, their bodies will not become better but will become more overtaxed. Images: These images were found on various news website articles about this program.